Bracus Zahn is the final boss in The Arms Dealer strike mission in Destiny 2. Bracus Zahn has multiple phases with different mechanics per phase. Bracus Zahn is the last boss in The Arms Dealer strike mission. However, he’s not the usual just unload a full clip in his face kind of like boss. Similar to Protheon, he has health-based mechanics which either intensify his attacks or increase his stats. Like every boss in Destiny 2, he has several other minions for company. In his case, he has a Centurion or two to help him bring on the damage. Unfortunately, it takes a little more chasing than most as he tends to run away a lot especially because of the big area he’s in. Upon approaching him, he will have two Centurions flanking him. After that, they’ll chase after you. Best you keep on moving but don’t use any grenades or supers if you can. You’ll need it for later as he has a large health pool. After defeating the Centurions, Bracus Zahn flees up the stairs. Chase after him but don’t forget to clear the deck of Cabal and Fallen. Again, don’t use your Super or your grenades. This isn’t even the main boss fight yet. 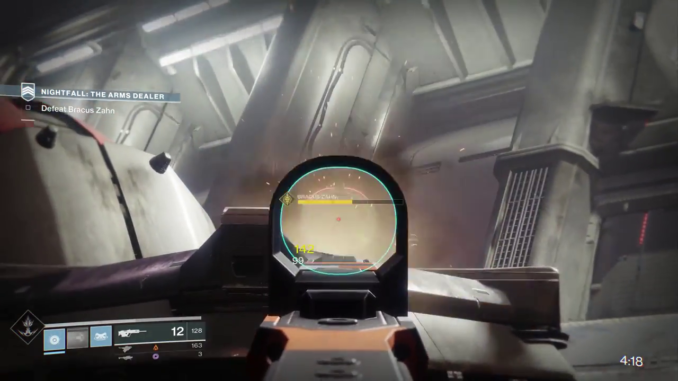 After defeating the Cabal and the Fallen, Bracus Zahn will try to snipe you from afar. Give him a few potshots if you can. There are also some sentry guns that need disabling so, shoot them down as well. If you have a party then, don’t stick together. While wielding a Sniper Rifle, he can’t attack more than one enemy. Thankfully, he doesn’t have too many AoE (Area of Effect) attacks that can immediately wipe your team. This triggers the moment he loses a third of his health. Once he does, he’ll immediately run and shield himself. You might want to prepare yourself. There’s an incoming bombardment from a few dropships with enemies. If you have a Barrier or you yourself are a Titan Class, corner yourself to a wall before putting up the barrier. This will prevent any from attacking you from behind. If you’re running as a team, the best thing to do is to FF (Focus Fire) one enemy at a time. This will make it easier to clean the area and sweep for stragglers. After killing all the enemies, you’ll find a Solar Charge. Find it the moment the prompt appears and bring a friend with you if necessary. With that, deposit it into the conduit. Next phase involves Zahn crashing down from the deck. However, he’ll have mobs accompanying him. To take them out, corner yourself by the crate and take them down as they come closer. Make sure you’re standing against the wall to prevent any of them from shooting you from behind. After taking out the mobs, Zahn will pull out a shotgun and engage in close ranged combat. Don’t stick to one another. The shotgun has splash damage and it will hurt. Instead, spread around and nuke Zahn with everything you have. It’s a do-or-die situation; grenades, Supers, heavy gunfire – throw everything at it. While doing this, have a Titan class or even a Hunter class draw his fire while you lay the damage. With that, he should go down.